This week’s spur of the moment concert-attending decision was to grab tickets to the Brandi Carlile show at the House of Blues. I’d always managed to miss her when she’s come through Chicago in the past, and I’ve always been curious about the House of Blues, so hey, why not. And, of course, I wasn’t disappointed in the slightest. The opening act was Angel Taylor, a 21-year old singer-songwriter from southern California. For someone so young, she has a huge voice. Her voice reminded me a lot of Adele and Duffy, young women who are sort of a throwback to another time and place, and comparisons to Alicia Keys are probably inevitable, though well deserved. Switching between piano and guitar, she sung about those universal experiences: bad relationships, broken hearts, and love despite it all. Keep an eye on her, because between her songwriting and her voice, she should start turning heads soon. She had an easy, humorous patter with the audience, sometimes seeming a little surprised by the warm reception she received. Angel even took the time to lead the audience in singing happy birthday to a fan up in the balcony. Songs from her debut album, Love Travels, included “Epiphany”, “Spinning Wheel”, and “It’s Easy”. She also threw in two awesome covers: “Womanizer” – and this is where I admit that I have a huge soft spot for covers of Britney songs – and Jet’s “Are You Gonna Be My Girl”. Her closing song – I thought it was “Not Even Human”, but the version online sounds different than what she sang – was particularly moving, with the repeated line of “girls have fragile hearts so don’t break them”. 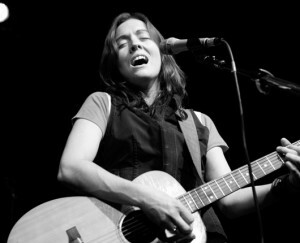 Brandi Carlile’s set started out with the full band gathering around one microphone, one of the twins (Tim or Phil Hanseroth) on ukulele, singing an a capella version of “Oh Dear”, from her upcoming album, Give Up the Ghost. It’s moments like that where you know that the performer you’re seeing is solid. It’s one thing to perform with a band, your voice layered under guitars and drums, but to perform completely exposed like that, well, it’s not something that everyone can get away with. As I mentioned earlier, I’ve never seen her live before, but have heard a lot of live recordings, so I knew she was good live, but I didn’t know just how good. Brandi and company put on an amazing show – tons of energy and charisma, lots of interaction with the audience. The audience was 100% into the show from start to finish. Lots of enthusiastic cheering, shouting, singing along. This was a crowd who loved everything about Brandi and it showed. Perhaps one of the most beautiful moments of the evening, highlighting both what a stellar performer Brandi is as well as how much the audience loved her, was when she stepped out from behind the microphone to the very front edge of the stage and waited for the house to get quiet. Eventually – amazingly – the room was silent as Brandi told the audience that she wanted to perform “Dying Day”, a song from her upcoming album, completely unplugged – no microphones, no amplifiers, just her voice and the guitar. The performance was spectacular, and a true show of just how strong of a singer she is. I was only a few people deep on the main floor, but I have no doubt that her voice carried to the back and top of the house. Standing right up front, though, it was almost like she was singing right to you, a private little concert in the midst of 1000+ other people. She followed up that song with three more acoustic renditions of new songs before, as promised, bringing the rock back. From the new album, songs included “Dreams”, “I Will”, “Pride and Joy” (including some great rocking out on the cello, from Josh Neumann), and “Before it Breaks”. Previously released songs included “Late Morning Lullaby”, “The Story”, “Turpentine” (including a three-part harmony audience sing-along), “Hiding My Heart” (the hidden track from The Story), “Have You Ever”, and “Happy”, which she said was about a friend she had as a teenager who she fell out of contact with. She wrote the song about her and put it on her first album, and the friend heard it and got back in touch with her. The encore set started out with an absolutely insane cover of Johnny Cash’s “Folsom Prison Blues”, but eventually took a slower turn in what she referred to as the bipolar section of the show. She closed with “That Year”, a song from the new album about a friend who committed suicide when they were teenagers, and then into Leonard Cohen’s “Hallelujah”, both solo acoustic. Both very beautiful, moving songs, and a fitting end to a very high-energy concert. Angel Taylor’s debut album, Love Travels, was released September 22 and is out now in stores and on iTunes. Brandi Carlile’s third full length album, Give Up the Ghost, will be released October 4 and is available for preorder now.